A Weekend Away is Precious! 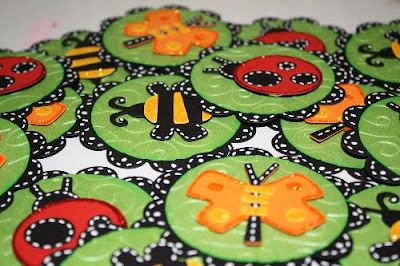 I've been busy as a bee working on a donation that I'm making for my kids' school fundraiser auction. It's a birthday party pack with 15 each of the following: invitations, thank you cards, cupcake toppers, and favor boxes. The auction is a garden theme this year, so I figured I'd just roll with that. These toppers will be adhered to lollipops (wrapped, of course), then you can just stick the sticks right into the cupcakes. Then they can double as favors for the kids to take home. Thanks for buzzing by today! These are so cute and what a generous donation! Bet they're gonna love these!